The trail rides are seasonal from May 1st – October 15th. They are offered 7 days a week and are by reservation only. Our individually tailored group rides offer a unique experience thoroughly enjoyed by our guests. 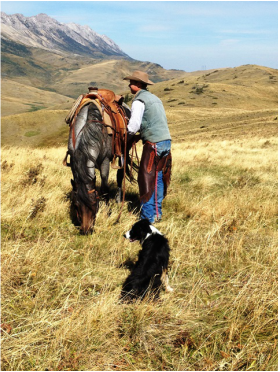 You are able to experience the true ranching lifestyle. You are able to ride our ranch horses that are well trained and who love their job. You will experience the lure and the wonders of the ranching culture while riding the untouched range and seeing the cattle. You may even get to see some of our incredible wildlife along the trail. The abundance of wildlife in the valley from bears (both grizzly and black), to elk, moose, deer and many birds, adds another layer of awe to those lucky enough to see them. It is just your group and our guide riding in picturesque mountain scenery!